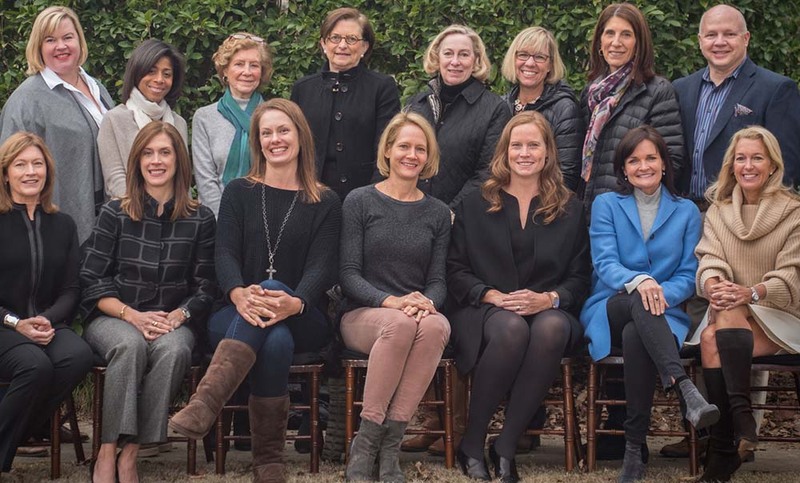 Ellen and Erin are side by side, seated, Ellen is second from left, Erin third - surrounded by the 2017 Landmark Luncheon committee. One of the unique aspects of Atlanta’s emergence as “Y’allywood” (as opposed to Hollywood) is seeing our local landmarks on the big screen in blockbuster movies. One of those landmarks that is used over and over again is our beloved Piedmont Park; Lake Clara Meer, the distinct stacked-stone steps and walls and the lush ball fields of the active oval. From theatre, dance and music to fine arts, Piedmont Park offers a blank canvas for creativity in Atlanta, both as a vibrant setting for art and music festivals, as well as a backdrop for movies, works of literature and television shows. Dorsey Alston’s Erin Yabroudy is joining with her friends Ellen Sacchi and Wick Garrard to celebrate the artistic versatility of Piedmont Park and its role in contributing to the economic vitality of the city at the Piedmont Park Conservancy’s 21st Annual Landmark Luncheon, which will take place on Thursday. Together, they are the co-chairs of the event. The Landmark Luncheon draws several hundred park supporters. It benefits the Piedmont Park Conservancy, which is solely responsible for the upkeep and expansion of Atlanta’s premier park. For such a huge project, the Conservancy relies more on donations than any other funding source. It is critical. We asked Erin why she supports the park. She loves that it is the gathering place for the diverse residents of Atlanta and the people who come to visit, and has such an incredible view of the Midtown skyline. In that regard, she puts it on par with the great parks of the world. And, of course, her children and her dog love it too. The luncheon is sold out - well done, Erin and Co.! - but if you’d like to support the Conservancy, click here!